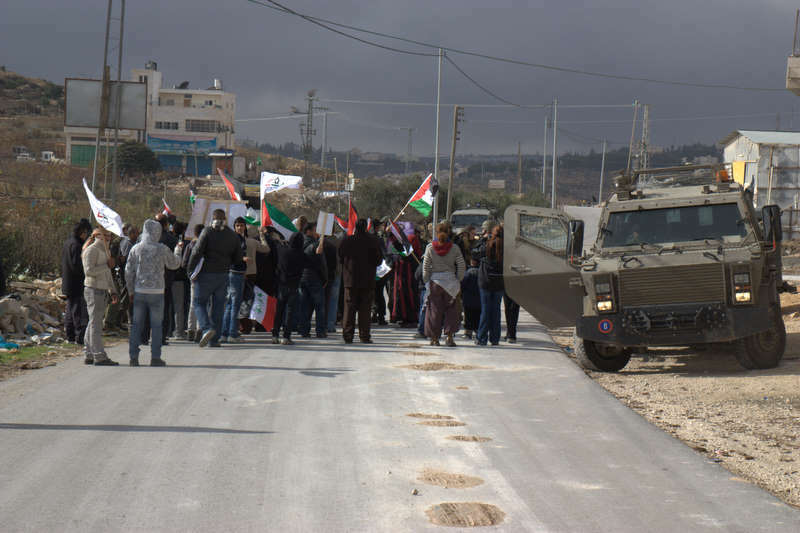 Anti-Wall protests were organized this Friday in the villages of Bil’in, Nil’in, Nabi Saleh, and al-Ma’ssara, located in the central and southern parts of the West Bank. Today, the theme of the protests was national unity among Palestinians.In Bil’in, protesters marked the sixth anniversary of the weekly anti wall protest. As has been the case every Friday for the past six years, international and Israeli supporters joined the villagers after the midday prayers and marched up to the gate of the wall separating villagers from their lands. Soldiers sprayed the marchers with “Skunk” water, fired live rounds, rubber-coated steel bullets and tear gas at them. Five were injured. Troops also tried to abduct people after spraying pepper-spray in their eyes, but protesters managed to prevent the abductions, witnesses told PNN. Hamza Burant, 18, was critically injured with live rounds, Ahamd Abu Rahma, 16, hit with a tear gas in the hand, while Kifah Manousr, 30, Fadi Omar, 30, Abdullah Yassen, 19, sustained minor injuries. Many were treated for the effects of tear gas inhalation. In 2007 the Israeli high court of justice ruled that the Annexation wall in Bil’in was illegal and should be re-routed, giving the villagers back half of the lands that were taken to build the wall. The army still refuses to implement the court order. In Nabi Saleh, three protesters were injured and seven were arrested during an anti-Wall protest on Friday. Five of those arrested were Israelis and two Palestinians. The three injured were shot with rubber-coated steel bullets by the army. In the village of Nil’in. villagers joined by Israeli and international supporters marched after midday prayers to the wall. A number of protesters suffered the ill effects of tear gas inhalation. Near Bethlehem in the southern West Bank, Al Ma’ssara villagers marched after the midday prayers and tried to reach the area where Israel is building the wall on land owned and farmed by the villagers. Soldiers stopped the march at the entrance of the village and forced people back using tear gas. Many were treated for the ill effects of tear gas inhalation.